I began my relationship with How I Met Your Mother near the middle of the show’s first season. I was in 8th grade, 13 going on 14. I’ve watched it regularly every season, never falling more than a couple of episodes behind. This is untrue of almost every other show (I caught up with season 8 of The Office this summer, after not being able to make it through while it aired). I spent my entire high school experience with Ted, Lily, Marshall, Robin and Barney by my side. When I graduate college next spring, the show will end. I will have spent almost half of my life, at that point, with How I Met Your Mother. My age obviously differed greatly from the characters’, so I grew alongside them, rather than with them. Regardless, I have spent many years of my life, the most important portion yet, with this show. And that is why the ending of tonight’s season finale hit me as much as it did. I know how long Ted has waiting for her, because I’ve been with him every step of the way. The episode itself was largely fine, one that will be remembered more for its closing moment than as a pinnacle of what the show can accomplish in a half-hour. That is why, perhaps, I’ve stayed in love with this show even through rough times (the first half of season 8, specifically): the moments. 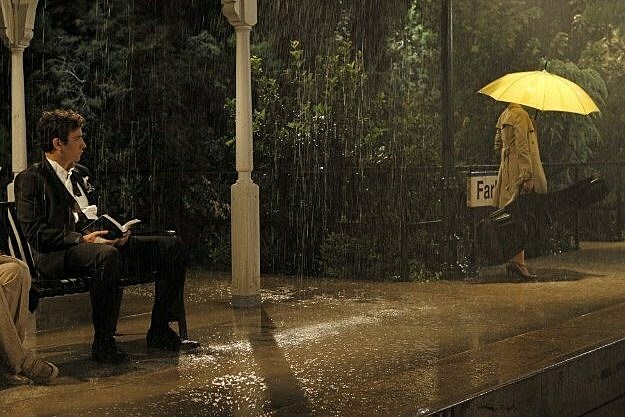 Even in the bad times, How I Met Your Mother has always been able to pull out breathtaking scenes. They certainly rely on familiarity, but there’s absolutely nothing wrong with that. It’s kind of the point of TV. Somebody who watches Mad Men’s “The Suitcase” as their first entry into that world will understand it to be well-made art. Those that have watched each episode preceding it will be floored by its brilliant utilization of character development. This isn’t to say that tonight’s episode, or any this season, are as good as that pinnacle of television. Rather, the point is that it’s a weak argument to blame one’s appreciation of a television episode on simply loving the characters and ignoring the flaws. I’m not ignoring any issues the show has had, or even had tonight. But they do not, ultimately, take away from those last moments, the ones that culminate in the titular activity, if you trade “I” for a “we” to signify the audience. As soon as “Simple Song” by The Shins began, I knew we were honing in on something large. The song is buoyant, and the exact kind of choice How I Met Your Mother would make in a situation such as this. As we glimpsed each character on the morning they went off to the location of Robin and Barney’s wedding, the song’s volume increased. Most important was a signifier that this show knows how to use to grand effect: the laugh track cutting out (this is perhaps the greatest argument in favor of the now-tired format). As Marshall stood at their airport, as Robin and Barney rode in a car driven by Ranjit (yay! ), and as Ted drove himself and Lily to the site of the wedding, we glimpsed the mystical yellow umbrella. It was obvious that something would occur, but what exactly was unclear. I had postulated earlier in the evening that Ted would meet the mother, but we would not. Instead, we saw her face. I am now, as I ever was, unquestionably a believer. That cut shocked me, not because I thought it impossible (though kudos on the casting being unreported previous to the episode; I didn’t know that sort of thing was still possible), just unlikely. But there she was, portrayed by an actress named Cristin Milioti, on her way to the wedding. I immediately teared up, though not as much as I will during the inevitably emotional series finale next spring (you may not know how I am with series finales; it is far from pretty). This wasn’t the actual meeting of Ted and the mother, or her appearance in a flash-forward, or anything that Ted is even cognizant of at this very moment. But it was still the mother. And maybe Ted’s ignorance of the near future increases the impact of the moment, as I wrote about back when “The Time Travelers”aired. Ted spends much of this episode planning a departure to Chicago that we know will never happen, due to his continued love for Robin. He has no idea that somebody else exists, so closely, in both distance and time. He has not yet seen her face. What a powerful moment that will be. As I touched on before, the conceit of the show allows the grandiosity of a moment such as this one. It is just a women’s face, purchasing a train ticket, laying her yellow umbrella on the counter. It means nothing in absence of the eight years that preceded it. But because we’ve been hearing of that face for almost a decade, it hits us in the gut: This is her. This is the woman that will change Ted’s life forever. And due to the connection that long-time viewers have with Ted, the emotional level is elevated when it causes one to think: who is standing at a train station near me? Who will I meet tomorrow?